The lumber cats are looking for a hard worker that can fell a tree with a single swipe. Click here to play! Do you have what it takes to join the team and collect plenty of big money payouts? You’ll be taking orders from the head cat as you head out into the forest to take down some trees. This hat wearing, cigar-smoking Tabby is worth up to 6,000 times your line bet if you can spin two to five of him across an active payline. He’s also a substitute that will replace other symbols to help you win. Take your cues from your co-workers, as each of these brawny felines will bring in big rewards. The axe wielding Tom will bring in a maximum payout worth 4,000 times your line bet while the lumber carrying Lynx will bring in up to 2,000. There are a few other symbols that will help you through the tree cutting business. Trucks and shacks are among them. The pine trees are particularly important as they’re not only the source of your lumber, but they’re also a scatter symbol. Spin two to five of them anywhere on the board to multiply your total bet. You’ll also want to stack up as many logs as possible. This wood only appears on selected reels but it will reward a number of free spins. Swing the axe with the lumber cats to bring in your share of the green. The green pine trees are scatter symbols. Two or more of them anywhere on the board will multiply your total bet by 2, 5, 20, or 200 respectively. They will also trigger a bonus feature. The head lumber cat smoking his cigar is a wild symbol. He will replace all others except the scatter tree and log symbols. He will also payout up to 6,000 times your line bet. Spin three or more trees anywhere on the board to trigger the Tree Climb feature. 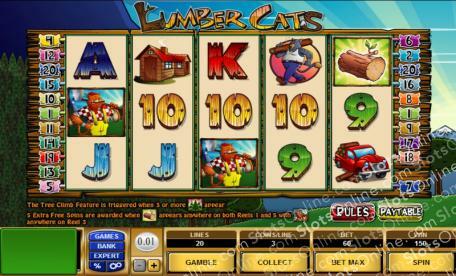 During this second-screen game, you will have to choose one of the lumber cats in a race up the trees. Your bonus payout will depend on your chosen cat's finishing postiion in the race.